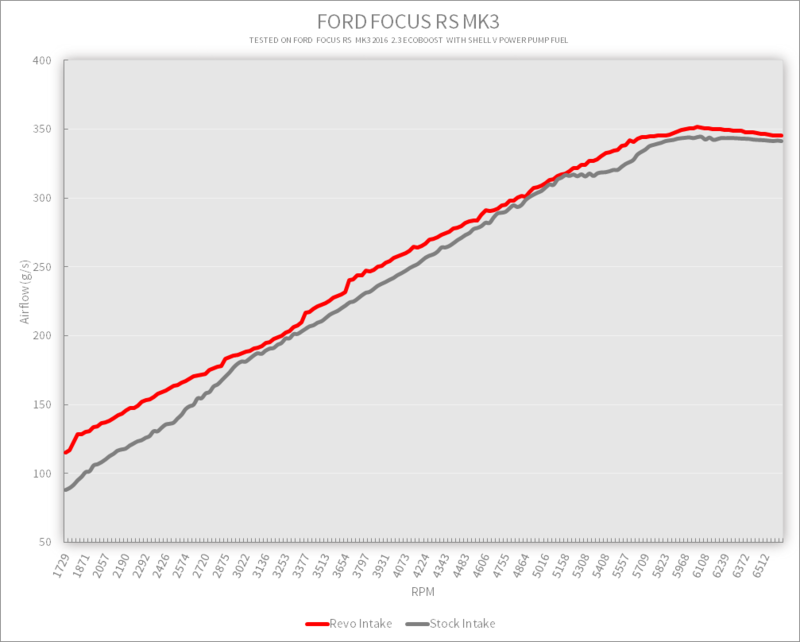 With ample efficiency for a stock vehicle, the OEM system quickly becomes a choking point for the engine when running more power. 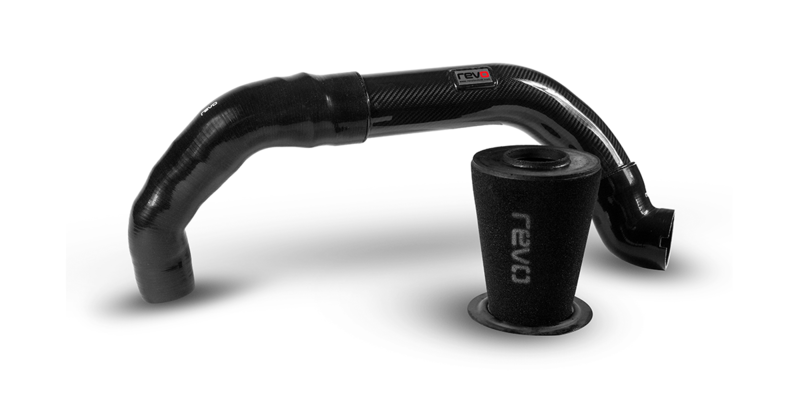 The Revo Carbon Series Intake has been designed to promote smoother airflow. Keeping the stock air box helps eliminate heat soak whilst directing cold air through the new filter and 12% larger diameter carbon pipe. Each component has been specifically designed to ensure no air turbulence from joins. This increases the rate at which air can flow, ensuring maximum performance at all tuning stages. The Revo Carbon Pipe has been designed and manufactured from the highest quality 3k carbon to allow a specific bend radius that simply is not possible in aluminium without joins. The increased internal diameter of the pipe is designed to directly replace the plastic hose and rubber corrugated parts. This reduces restriction and maximises smoother airflow to improve both power and torque throughout the rev range. There is two 4ply silicone hoses included, both offer smooth internals and flush-fit joins onto the carbon pipe for a smooth transition of air. This eliminates unwanted turbulence as the air transitions between parts. The constant taper of the turbo inlet hose allows the airflow time to adjust to the change in pressure, allowing the turbo to run more efficiently. 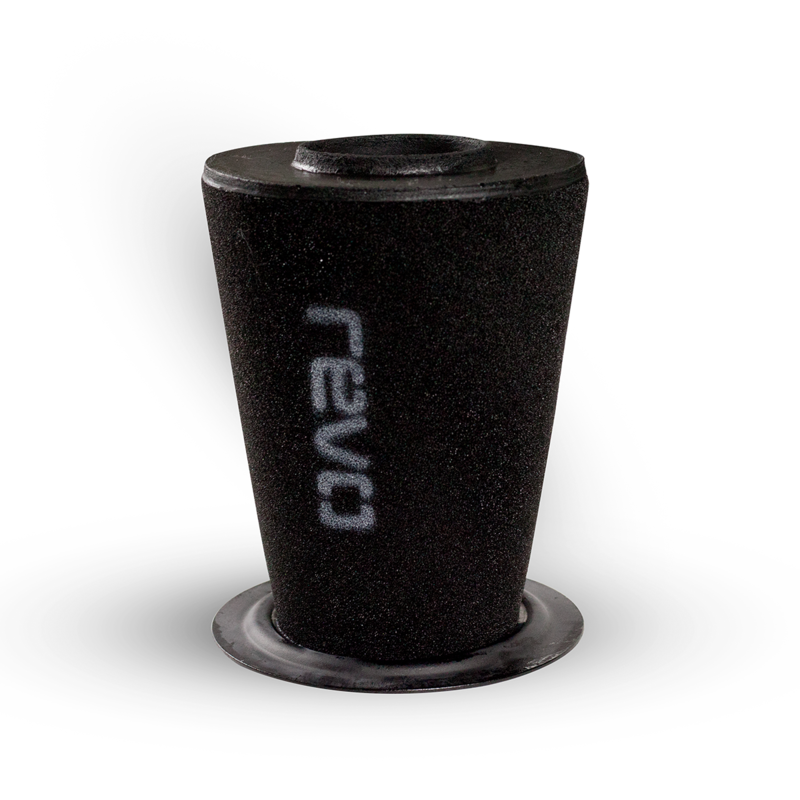 The cone shape of the Revo filter was designed to allow more free flowing air around the filter, helping reduce intake temperatures and increase performance, whilst the custom specification mesh allows the filter to keep its shape. The end of the filter has a specially designed spinning which returns into the filter channelling the air to the centre of the outlet, promoting smoother more direct airflow. All Revo products are designed in-house and are rigorously tested. By utilising the latest 3D printing technology, the latest CAD and CFD programs, hub dyno and Revo data acquisition software we are able to ensure our products meet the high expectations of Only The Driven. The Revo carbon intake allows the RS turbo to run more efficiently, intake a larger volume of air and minimise turbulence. 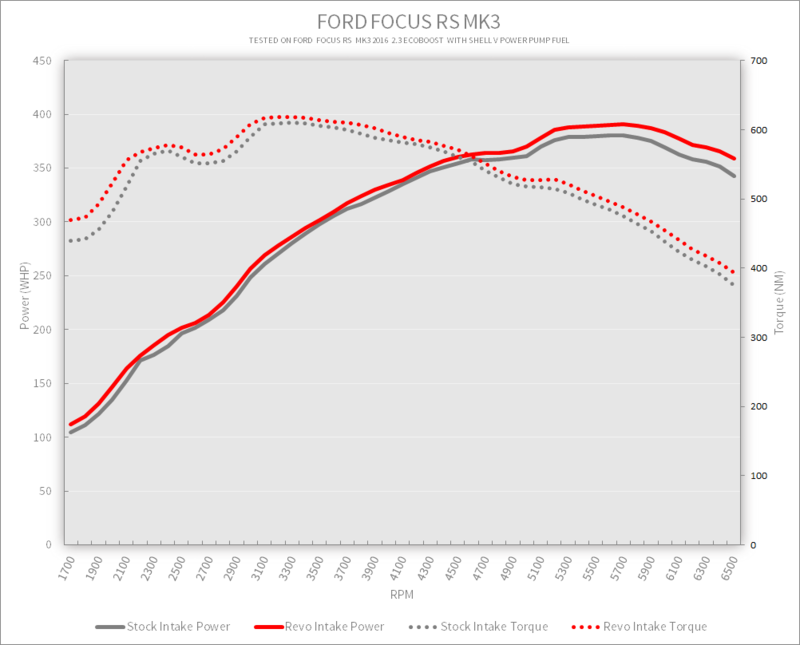 This increases power and torque, especially at the top end of the rev range as highlighted during controlled dyno testing. A constant taper in the hose ensures a smooth transition of airflow from the airbox to turbo and results in an increase in air volume over stock. Further helped by fully stepped internals that match to the outlet and inlet for the ultimate in airflow characteristics.Designed to fit in exactly the same way as the factory part, while the Revo kit has significantly increased the volume of airflow through the larger carbon pipe and smoother transitions, the same OE fit is retained. Testing on the Revo Ford Focus RS fitted with a Revo Performance Pack, the Revo carbon series intake gave a healthy gain of 13WHP and 10NM at peak over the stock unit, with a consistent gain throughout the rev range.At higher RPM, a maximum increase airflow of 11 g/s allows the stage 2 package pulls together all the uprated components and gives an impressive 16whp and 18NM @ 6500rpmon using the stock intake.